Long-term synoptic observations of the Sun in different wavelength regions are essential to understand its secular behavior. Such observations have proven very important for discovery of 11 year solar activity cycle, 22 year magnetic cycle, polar eld reversals, Hale's polarity law, Joy's law, that helped Babcock and Leighton to propose famous solar dynamo model. In more recent decades, the societal impact of the secular changes in Sun's output has been felt in terms of solar inputs to terrestrial climate-change and space-weather hazards. Further, it has been realized that to better understand the activity phenomena such as flares and coronal mass ejections (CMEs) one needs synoptic observations in multiple spectral lines to enable tomographic inference of physical parameters. Currently, there are both space and ground based synoptic observatories. However, given the requirements for the long-term stability and reliability of such synoptic datasets, ground-based facilities are more preferable. Also, the ground based observatories are easy to maintain or upgrade while detailed and frequent calibrations are easily possible. The only ground-based facility that currently provides full-disk velocity and magnetic eld maps of the Sun around the clock and at good cadence, is the Global Oscillations Network Group (GONG) network of National Solar Observatory (NSO) which is operational since the mid 90s. Due to its aging instrumentation, operating for nearly three decades, and new requirements to obtain multiwavelength observations, a need is felt in the solar community to build a next generation synoptic observatory network. 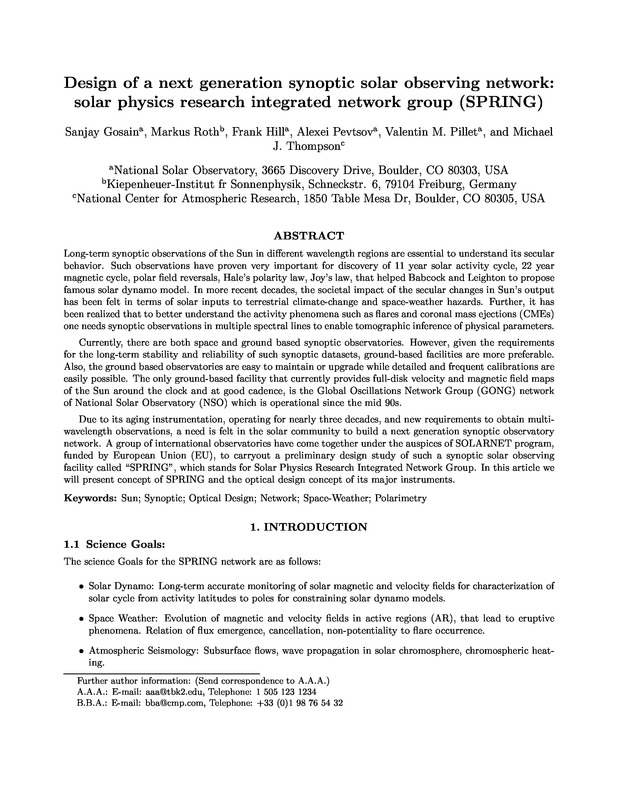 A group of international observatories have come together under the auspices of SOLARNET program, funded by European Union (EU), to carryout a preliminary design study of such a synoptic solar observing facility called "SPRING", which stands for Solar Physics Research Integrated Network Group. In this article we will present concept of SPRING and the optical design concept of its major instruments.